When BabyC was around 5 months old, we started to introduce some solid foods. Like most parents, we tried rice cereal first. BabyC took a taste, looked offended, and refused to try another bite. We tried again the next day, and she just wailed. We wanted mealtime to be a positive experience, so we quickly moved on to other foods. I pureed and froze loads of organic vegetables, and we dutifully tried feeding BabyC a little bit each day. We could never get her to take more than a couple of spoonfuls. Mostly out of my own boredom, I started feeding her some soft finger foods like pieces of cooked sweet potatoes or carrots. She quickly mastered the pincer grasp, and she would devour lots of food as long as she could pick it up herself. 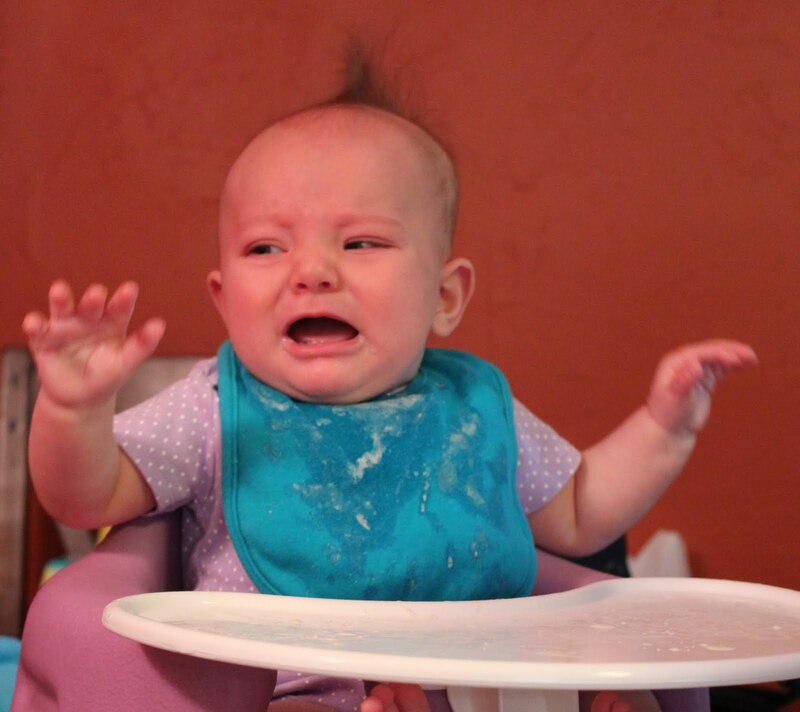 I gave away all of our pureed food to a friend whose baby dutifully ate whatever was in the spoon headed to his mouth. By 7-8 months of age, BabyC was finally consuming a significant amount of food, but it was all as finger foods. I still couldn’t get her to eat any fortified rice cereal or much of anything from a spoon, and that worried me. Why? Because our pediatrician told me that my baby now needed iron, and fortified cereal is where babies get iron. Furthermore, my baby was high-risk for iron deficiency because she was breast-fed (vs. formula, which is fortified with iron). What? What happened to breast milk as the perfect food? And what did babies do for iron before fortified cereal and formula came on the scene? I know I’m not the first parent to worry about this problem. Even if your baby happily ate from a spoon for a few months, many babies do reach a point where they want to feed themselves finger foods, and their independence should be encouraged. However, as your baby expresses that independence, she may decide that certain tastes and textures are not to her liking, and you no longer have the option of sneaking a less desirable food into a puree of a favorite food. So I wondered: Does my baby get enough iron from her finger food diet? Are fortified cereals really that important? I’ve spent the last few weeks researching this question, and it has turned out to be a really interesting topic. The result of all my research has turned into something bigger than a blog post. I guess the researcher in me has a hard time stopping until I’ve really covered a topic, but a 10-page article is not good blog material. Anyone know of a print or online media outlet that might be interested in an in-depth article on infant iron nutrition? Meanwhile, you might be wondering what I concluded about my own child’s iron nutrition. I think she is getting enough iron, but just barely. And fortified cereals are an important part of her iron supply – without them, it would be hard to get enough iron into a baby her age. I have been able to get BabyC to eat some regular fortified oatmeal, maybe because it has more texture and less of a metallic taste than the baby varieties. Though oatmeal doesn’t have as much iron as baby cereal, it is still her #1 source. Cheerios are a favorite snack food and are also fortified, so they play an important role in meeting BabyC’s iron requirement. Meat is high in iron, but many babies this age, including my own, don’t love the texture. BabyC eats lots of legumes and veggies, which are certainly nutritious and contain some iron, but it would be hard to meet her iron requirement using these sources alone. Even when babies and their mothers have access to good nutrition and healthcare, iron deficiency is a real problem, estimated to impact about 10% of all toddlers in the U.S. Iron deficiency during infancy can result in cognitive and developmental delays that last at least into the teens. And its true – breast-fed babies are at higher risk. Your pediatrician should check your baby for anemia by measuring hemoglobin concentration around 9-12 months. Anemia would indicate a severe iron deficiency, but a baby can be dangerously iron-deficient without yet being anemic. BabyC’s hemoglobin tested out fine at her 9-month appointment, but we’re going to keep working to get iron rich foods on her highchair tray. This mama isn’t taking any chances. I’ll be posting more on iron over the next week or so. I’m working on pieces about practical strategies to increase the iron in your baby’s diet and on why iron supplementation is controversial, so stay tuned. In the meantime, feel free to post any specific questions you might have in the comments section. Anyone have a baby that has been diagnosed with anemia or prescribed iron supplements for being high-risk for iron deficiency? Hi Alice! Molly from Putney here. My baby gets a lot of his iron from canned sardines– they are pretty mushy and he has loved them since 8 months or so. I feel like a lot of people would assume that their strong flavor would put a baby off but i find that the stronger a flavor the more he likes it! I'll try it Molly! I'm a little hesitant to use too many canned foods because of concerns about BPA. That may be overkill, but I'm nervous about it and haven't done enough research yet to ease my fears. Sardines would make a great occasional food, and maybe I can even find them fresh here. I think you're right about flavors though – we assume babies will be turned off by strong flavors, but it is probably better to try things and let them surprise us (and develop their palate!). we give the bean (who is 8 months old) vitamin drops containing iron (that is, we have recently committed to actually doing that, instead of just looking at them on the shelf), even though it grosses me out to have him smell like blood when i nurse him afterwards. he also loves meat (just like his mama). that said, i have a pretty hard time worrying about this (or any other deficiency). i eat a good diet; increasingly, so does he. (i was anemic for a while after he was born, and I did do my best to get my own levels up, though all iron supplements I tried made me sick in one direction or another. I ate a LOT of pot roast.) As you say, fortified cereals, etc., are recent creations, and as consumer products, not ones inspired strictly by science. i really only think about iron in terms of limiting his ability to absorb any lead he encounters. Most breastfeeding sites claim that 50% or more of iron in breast milk is absorbed, but more recent studies using more accurate methodologies have estimated absorption at around 15-20%. Fortified foods may only be absorbed at 5%, similar to iron in plant foods, but they contain enough iron to make up for this low absorption. Thanks for your question! The absorption issue is often misunderstood, so I appreciate the chance to clarify it. My baby was diagnosed with mild iron deficiency (microcytic) anemia and prescribed an iron supplement, Fer-in-Sol. I was happily and easily giving it in soft food like mashed potato. I went for a refill and got a different pharmacist who warned me that it may discolour his teeth, even if they are below the gums. She recommended giving it in liquid with a straw and cleaning the mouth right after. Does anybody know more about iron and teeth? I know this is an older post, but I’m just finding it now. I hope you don’t mind some questions. From my understanding, while formula has more iron, it is not as easily absorbed as the iron in breast milk, and therefore formula fed babies are at a higher risk for problems than breastfed babies. In addition, baby cereals are empty calories that turn into pure sugar because grains cannot be digested until the age of one. Yes, the iron in formula isn’t as well-absorbed as the iron in breast milk, but there is so much iron in formula that babies get more than enough iron. So formula-fed babies have a lower risk of iron deficiency. It’s also true that since much of the iron in formula isn’t absorbed, they do have a lot of extra iron in their GI tract, and it’s possible that that’s not a great thing for building a healthy microbiome and other gut outcomes. I’m actually working on the topic of amylase activity and grains for babies, because several people have asked me about how well babies can digest grains. Stay tuned for more on that. Any starch (as found in grains and many fruits and veggies) that’s digested is broken down into sugars, because glucose (a simple sugar!) is what fuels our bodies and brains. Science of Mom, could I use spirulina to meet the iron needs of my 7 month old breast fed son? Is spirulina safe for a young baby? I thought I would make him spinach to meet his iron needs until I read about oxalates and nitrates at momtastic.com. She recommends that spinach not be introduced until 10-12 months of age. I don’t think I’d use spirulina for such a young baby. A couple of concerns: first, it’s an unregulated supplement, and there are documented cases of contamination that could be serious especially for a young baby. Second, this is such a great window for your baby to learn about real foods – exploring tastes and textures – and there are lots of great options for iron-rich foods. Spinach is find to include in moderation, but it won’t be a huge source of iron since it is in non-heme form and poorly absorbed. My baby is 6 months and is mostly breastfed but has one or two bottles of iron enriched formula a day. He’s starting to have pureed fruits and veggies I make at home. Everytime introducing food to my baby is brought up im told he joins be eating rice cereal as I just don’t trust that it’s healthy and or necessary. Would he be getting enough from the Breastmilk, formula with iron, and fruits and veggies? If I have to give him some oats pureed would I have to give it to him once a day every single day? He’s having ouree twice a day so one meal is fruits and veggies and the other meal is oats? I feel like everyone’s pushing the rice cereal and im trying to research myself but am getting confused and overwhelmed. You said you’ve done a lot of research so I figured I would ask you. I only discovered your blog recently, so I’m afraid I am not giving my 7 month-old, exclusively breastfed baby enough iron (or any at all, because we just started introducing solids). I was going with the famous chant “food before one is just for fun!”. Now I’m worried because we did not do delayed cord clamping (we wanted to, but ended up with an emergency cesarean and it just escaped my mind at the time to request it). So, now I’m starting him on solids, and even started some infant oatmeal cereal, but just in case I’m also giving him infant multivitamin drops that have Vitamins C, D and iron, among others, although no zinc. What are your thoughts on multivitamins? I know it’d be best to get vitamins from foods, but I have just starting introducing foods to him and the process is slow, and I don’t want him to go deficient in the meantime. On a separate subject, I know you recommend feeding meat for iron and zinc, but my husband and I are mostly vegetarians and only eat fish. Would that be ok to do? If so, what kinds of fish would be best to feed to baby? Thank you for putting all this information together! Hi Rosanna – I’m working on a post on iron supplements for breastfed babies, which I’ll hopefully be able to post in the next couple of weeks. In general, I think multivitamins are unnecessary. However, it is good to give a vitamin D supplement, and it might be reasonable to give iron if baby isn’t eating much in the way of solids yet. And it may be that a multivitamin is the easiest way to give both of those right now, and it probably won’t hurt. I would work towards giving more food sources of iron, though, and once he picks up his solids intake, you can switch to just vitamin D. It’s always worth checking with your pediatrician, as he or she might have a different perspective. How do you know he’s getting enough iron (and zinc)? I would say if he’s eating at least a serving of fortified oatmeal plus a few other sources throughout the day, then he’s probably in good shape. Fish is a great source of heme iron, especially sardines and clams, but also tuna. Egg yolk is also a good option. Add in a few non-heme sources (beans, lentils, etc) paired with a source of vitamin C, and he’s probably going to do great. It’s normal for iron to dip a little low at this age, but within a month or so, you’ll hopefully see his intake pick up. BabyM is 8 months now and really enjoying eating just about everything we put in front of him, and there was a big jump between 7 and 8 months. That doesn’t happen with every baby, but it’s common. Hope this helps! Best wishes to you! So does taking a prenatal Vitamin with high iron content like the citra natal 90dha, increase the amount of iron in my breastmilk?